Was Dr. Conrad Murray criminally negligent for administering a powerful anesthetic and then abandoning his patient, or was Michael Jackson to blame for his own death? Seven men and five women will now decide. Closing arguments concluded shortly before 4 p.m. Thursday in the involuntary manslaughter trial of Jackson's personal physician. Los Angeles Superior Court Judge Michael Pastor read jurors their final pre-deliberation instructions. Jurors were then dismissed for the afternoon. Final arguments ended after 22 days of testimony that included dramatic accounts of what led to the King of Pop's death on June 25, 2009. "I'm on pins and needles," Jackson's sister, La Toya, tweeted Thursday morning before Deputy District Attorney David Walgren opened by saying Murray violated "a relationship of trust" with her brother. Walgren repeatedly referenced Jackson's three children during his closing argument. "The evidence in this case is overwhelming," said Walgren, who received a standing ovation from Jackson fans in the hallway outside the courtroom after concluding his argument. "It is abundantly clear that Conrad Murray acted with criminal negligence, that Conrad Murray caused the death of Michael Jackson, and that Conrad Murray left Prince, Paris and Blanket without a father." Walgren played audio of trial testimony and reminded jurors of statements from people who spoke with the King of Pop in the days before his death. He also mentioned the recording of Jackson that was played for jurors early in the trial. "Michael had plans and hopes and dreams," Walgren said. During the recording, Jackson, his speech slow and slurred, talked about his plans to amaze his fans with the concerts and open a children's hospital after the tour. "He wanted to express his voice throughout this tour," Walgren said. "He wanted to repay his fans. He wanted to show gratitude for all their years of support." Walgren also hammered on Murray's delayed decision to call 911 after realizing that Jackson was not breathing. The only thing that would convince a medical professional to not call 911 is self-interest, Walgren said. "Conrad Murray had other things on his mind -- protecting Conrad Murray," Walgren said, adding that Murray made several phone calls to Jackson staff members and his own girlfriends. Defense attorney Ed Chernoff said Murray's first reaction after realizing Jackson was not breathing was an attempt to revive the singer. Chernoff attacked the testimony of a Jackson security guard who told jurors what happened after he arrived in Jackson's bedroom. Alberto Alvarez claimed Murray told him to hide drug vials and remove Jackson's children from the area before calling 911. Chernoff questioned Alvarez's recollection of events during the frantic moments before Jackson was transported to the hospital. Under cross-examination, Alvarez was asked how he could accomplish everything he claimed during a limited timeframe. "'I'm efficient,' that was his response," Chernoff said. "It's not efficient, it's impossible." During his closing arguments, Chernoff said prosecutors hadn't proven that Murray committed a crime by giving Jackson doses of the anesthetic propofol as a sleep aid in the singer's bedroom. 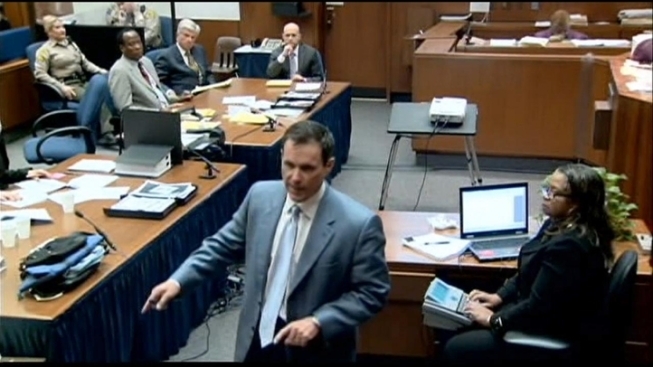 "They want you to convict Dr. Murray for the actions of Michael Jackson," Chernoff said. He urged the jury to closely consider Murray's lengthy interview with police and said his words show he didn't give Jackson the deadly dose. Chernoff also urged jurors to consider the testimony from Murray’s former patients. “You saw his patients; you know what he did for those people," Chernoff said. “Does it seem like he has a disregard for human life?” he asked. Before attorneys began closing arguments Thursday, Judge Michael Pastor explained to jurors that prosecutors alleged that Murray performed legal acts in his care for Jackson, but that he acted recklessly with criminal negligence. "Even if you accept the defense version of the facts, Conrad Murray is guilty of involuntary manslaughter," said Walgren as he finished his closing argument by describing an offense that involves an unintentional killing that results from recklessness or criminal negligence. The defense has attempted to portray Murray's superstar patient as an addict willing to take great risks in his quest for sleep as he prepared for a series of planned London concerts. Jackson pleaded for medications to help him sleep and ingested lorazepam without telling Murray, creating a "perfect storm" of medications in his system, according to the defense. Prosecutors claim Murray was conducting a "pharmaceutical experiment" when he administered the powerful sedative propofol as a sleep aid. Prosecution witnesses repeatedly questioned Murray's decision to administered propofol, usually reserved for surgical settings, at Jackson's rented Holmby Hills without proper monitoring equipment. The prosecution also targeted Murray's actions after he returned to Jackson's bedroom and realized his patient was not breathing. Phone records showed Murray was on the phone with his girlfriends. Prosecutors said he delayed calling 911 and attempted to hide drug vials. Murray did not testify in his defense, but jurors heard his account of the day Jackson died on a recorded interview with Los Angeles Police Department detectives. Murray provided a chronological account of June 25, 2009, starting at the time Jackson arrived home after a late-night rehearsal for his planned "This Is It" concert series in London. Murray described a restless night and the singer's pleas for something to help him sleep. "He tried to close his eyes, and nothing would work," Murray said during the two-hour interview. "He complained that he would have to cancel rehearsals... and not satisfy his fans if not rested well." It was about 10:40 a.m. that Murray said he decided to administer propofol, a drug he said Jackson called his "milk." His account to detectives included the frantic moments after he realized Jackson was not responsive. It was Murray's disclosure regarding the location of propofol bottles during the interview that prompted investigators to search the superstar's bedroom two days later. That resulted in a police investigation and Murray's arrest in the high-profile case. The interview was Murray's attempt to "get ahead of the story," Walgren said during closing argument, adding that Murray assumed the medications had already been discovered. If convicted, Murray faces up to four years in prison and loss of his medical license.